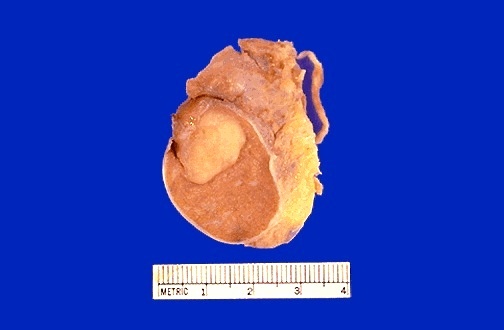 The mass lesion seen here in the testis is a seminoma. Germ cell neoplasms are the most common types of testicular neoplasm. They are most common in the 15 to 34 age range. They may have more than one of several histologic components: seminoma, embryonal carcinoma, teratoma, choriocarcinoma. The one that is most likely to be of a single histologic type is seminoma, as in the testis seen here.